Classic 19th Century french (Crapaud) armchair. Original turned legs and castors. Our Period armchairs/sofas - typically French/Swedish/British are priced stripped back ready for reupholstery. We can offer a traditional upholstery service where you could choose to use one of our favoured fabrics, antique French linen, 'Cabbages & Roses' & Kate Forman or any other designer on request. You're also welcome to provide your own fabric. Please call the shop to discuss. 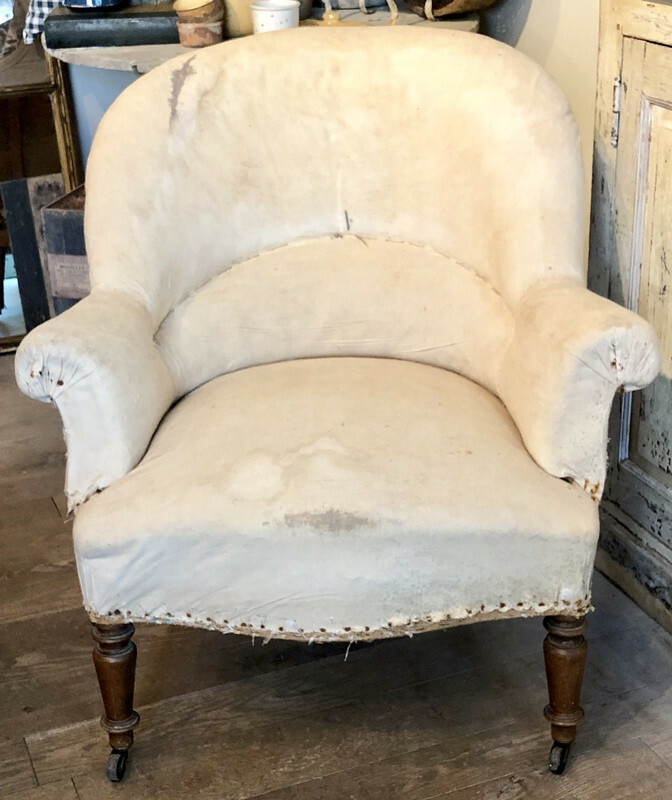 Classic 19th Century french (Crapaud) armchair. Original turned legs and castors. Our Period armchairs/sofas - typically French/Swedish/British are priced stripped back ready for reupholstery. We can offer a traditional upholstery service where you could choose to use one of our favoured fabrics, antique French linen, 'Cabbages & Roses' & Kate Forman or any other designer on request. You're also welcome to provide your own fabric. Please call the shop to discuss.